Cordray Farms Beef Shares ready to cut in about 2 weeks! They're finally ready! We have a few steers hanging in the dry aging cooler and they'll be ready to cut into shares in 2 weeks. If you'd like us to put your name on a share, please send in a $100 deposit check with your name and phone number to the address below. We'll call you to arrange an appointment for you to pick up your meat when it's all cut and frozen for you. If we end up with more deposits than shares, we'll put you at the top of the list for the next batch that should be ready in about a month. This first group is going for just shares, so if you are waiting on a side I'm afraid it'll be just a little longer. Shares will be about 50 lbs. and cost $4.95 per lb. If you want more information on shares, click here or visit www.cordrays.com. If you have any questions, please let us know. Is it real or is it a mount? One big hint: The real one had his mouth propped open with a knife. The gator mounts look amazingly real. Get in on the action by applying today for your gator tag. For more taxidermy pictures, click on the title link above. 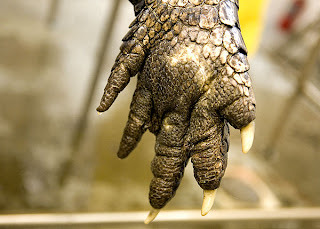 Don't forget to apply tomorrow for the Alligator Drawhunt! 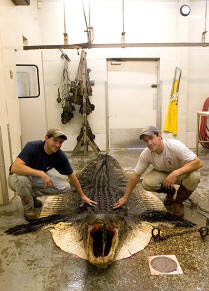 Online registration for the Alligator Drawhunt begins May 1st and continues until June 15th. Be sure to get your registration in on time! For the official announcement from DNR, click here.